With its bold band that covers half the cigar and crate-like boxes, the Alec Bradley Black Market is an iconic cigar. Released in 2011, it has garnered a firm following and has led onto a range or blends such as the Esteli and Vandal. If you want to jump ahead, simply use the links above. Founded by Alan Rubins in 1997, Alec Bradley is a critically-acclaimed cigar brand. In 2011, the brand launched their new Black Market range at the International Premium Cigar & Pipe Retailers (IPCPR ) Convention. 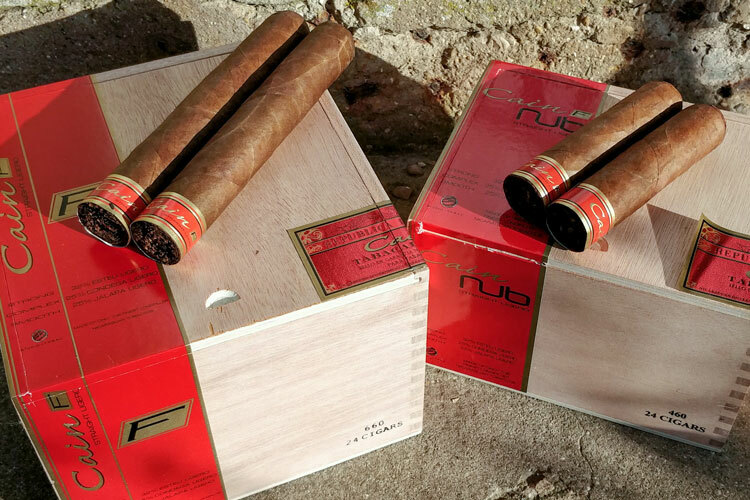 Aside from its unique branding with large military-style bands and cargo crate boxes, the cigar featured a unique blend. Firstly, it consisted of a myriad of tobacco sourced from four different countries. Honduran and Panamanian fillers are enveloped by a Sumatran binder from Ecuador. Finally, a Nicaraguan wrapper conceals the body with its dark earth hue. Furthermore, only Viso and Ligero leaf primings were used to make the cigar without either Volado or Seco primings from lower down the plant. As you’ll learn in our guide to cigar anatomy, lower primings are mild in flavour but ensure a good burn. Meanwhile, the higher leaves tend to be more intense with fuller flavours. 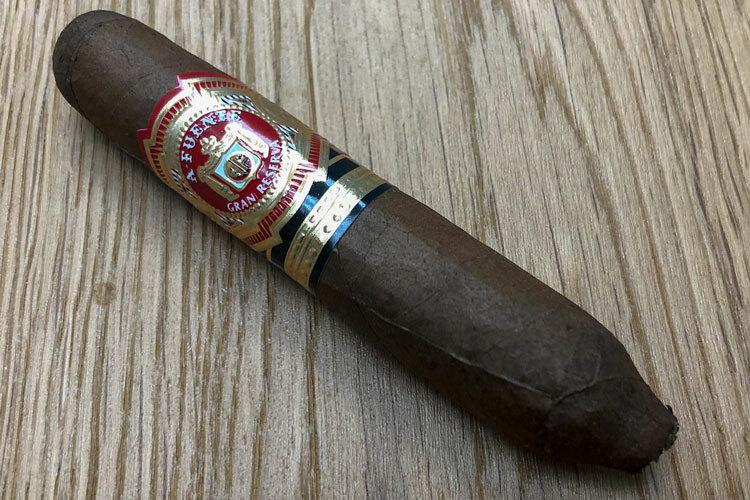 Therefore, it should be interesting to see how this particular cigar fares in a review given that it has also received a number of rewards and accolades. Interestingly, the Black Market’s main band acts as a sort of sheath that covers half of the cigar. Whilst it’s surely an aesthetic choice, it likely offers some protection to the wrapper. Removing this reveals a dark cocoa wrapper that glistens with a rich oily sheen under the sunlight. The body feels even and firm all the way down to the foot with a light spring when pinched. There are some lumps in the wrapper but they’re quite consistent. The aromas complement the wrapper’s hue quite well and we’re tantalised by immersive notes of dark chocolate, rich espresso and a hint of leather. Our reviews are never based on a single cigar but we instead smoke several before committing to the write-up. Since cigars are hand-made, they can vary in experience. By basing our reviews on more than one, we check for consistency and rule out any anomalies. Furthermore, this particular review is based on having smoked no less than three Black Market Toros. After cutting above the Cuban-style triple cap, a quick dry draw indicated a promisingly mild resistance. There were some very intriguing notes too, which including a coppery espresso and some dark chocolate. Being a fan of gourmand smokes such as these, I was looking forward to lighting up. The Black Market opens with thick plumes of smoke that die down after about half a centimetre of ash. It’s quite mealy and leaves a dry layer across the palate. After a few draws, the cigar reveals particularly woody aromas that are reminiscent of burnt cedar, charcoal and oak. There’s also a hint of earthy patchouli that borders on labdanum musk. At about the half-way point, I was able to slide the band nearer the cigar’s head so I could still enjoy it. The ash is stacking nicely with only a few flakes. The overall flavours haven’t evolved to a huge degree but I am beginning to pick out some new notes. The charred cedar has evolved into a more smokey cherry wood whilst the oak is more reminiscent of black tea. Meanwhile, the earthy patchouli has transitioned into a musky labdanum as I hoped it would during the first third. Nevertheless, the overall is very similar and is very consistent. As I made my way into the final third, I noted just how smooth the thick smoke remained. Even in the final third, the bouquet is still quite dry and leaves a viscous layer over the palate. In terms of aromas, I note that the charred cedar from earlier has returned with much more intensity. Meanwhile, those woody notes have transitioned into something closer to charcoal whilst I experience leather on the retrohale. However, it doesn’t feel like a huge evolution and the flavours are quite understated. I confess that I was left wondering between draws whether the cigar was manipulatively complex or just bland. Nevertheless, it was still enjoyable until I made my way to the nub. Suddenly, there’s an overpowering peppery note that had married with the leather. Consequently, the dry flavours have become quite tart. I realised that it was now the end of the journey. At first, the Black Market’s burn starts off as quite choppy but this evens out nicely after about 3/4 of an inch. Furthermore, the ash’s backbone is quite strong and I was able to enjoy a solid 2″ stack before it dropped off. As for the burn temperature, it wasn’t cool nor was it hot but rather ambient. However, I could have been misled as it was a very hot day. Otherwise, the draw gave only a mild but palatable resistance whilst the overall smoking time came to over 100 minutes. As a particularly dry and woody smoke with hints of leather, there’s a myriad of potential accompaniments. Whilst some may find harmony in smokey or peaty whiskies, I’d be inclined to pair this with a very dark and mature rum. On a drier day, I’d consider my usual beverage of an espresso. However, if possible, I’d actually go for a tighter and more intense ristretto if the opportunity presented itself. As for soft drinks, Coca-Cola would be a fair choice thanks to its thick caramel flavour as would a herbaceous root beer. When Paul handed me a few of these for a review, I got a look at the box, which comes in a very elaborate carte-like box. The style of this box is reminiscent of bootlegging and fits the cigar’s name very well. As for the bands, I’ll cover this below as they’re certainly worth of note so I’ll jump straight to the value for money. Although the Black Market isn’t the cheapest stick, it’s usually comfortably under the $10 price point. Therefore, it isn’t a particularly burdensome investment. Given the quality of the smoke, the novelty and enjoyment, I think it’s worth it compared to others on the market. As mentioned earlier, the larger band covers half of the cigar and needs removing before the cigar can be lit. The paper used has a craft-style print with the name stencilled across it. However, it’s made with glossy paper, which makes it easy to remove. Aesthetically, it’s quite interesting but I’m curious as to its practicality. Although it is more of an inconvenience when it comes to lighting, I imagine that it could help protect the cigar during storage and transport. Once this has been peeled off, it reveals a smaller band underneath. Personally, I think this was quite ingenious and I like how only half of the smaller band that says “Alec Bradley” can be seen until you remove the larger one. Once removed, it also reads “Black Market”, which ensures the name stays visible even after removing the larger band yet isn’t redundant when still attached. Unusually, it sits at the half-way point and needs removing earlier unless you can slide it down. Love them or loathe them, you must admire the originality of these bands and I’ve yet to see another brand do something as original as the Black Market. When Should You Smoke An Alec Bradley Black Market? Overall, the Black Market’s aroma profile makes it one of those late-afternoon or evening cigars to enjoy after a hearty meal. Thanks to its tough construction, it’s a cigar that I’d consider outdoors. For instance, it’s a great cigar for during an afternoon barbecue with the boys or when out fishing or golfing. Alternatively, it’s an enjoyable and lengthy cigar for a winter evening inside whether social or for some me-time alone. With its larger than life bands, you might consider removing the first one before taking it with you to more formal events. However, it’s something that I’d probably leave to more casual yet equally special occasions with friends. For those who enjoy heady and musky cigars with thick smoke and tar, you could do far worse than an Alec Bradley Black Market. Whilst it doesn’t show much evolution throughout each third, there is an admirable level of consistency, which some people may indeed prefer. Some may consider it as intricate and complex whilst others may perceive its very understated aromas as bland. Nevertheless, this may be just a question of preference, palate and perspective. As such, this isn’t something I’d recommend to beginners but rather seasoned enthusiasts unless you’re looking to try fuller-bodied cigars. Furthermore, it’s novelty value is quite notable and it’s worth taking a closer look at the box and its attention to detail. Reviewed by Charles-Philippe, on 24 July . "A beefy and musky cigar. With notes of charred wood and leather, this is an enjoyable yet heady cigar for enthusiasts." Charles-Philippe is a Franco-Briton who, in forgetting where he parked his time machine, settled down somewhere between Paris and Champagne during the early 21st Century. A cheese, wine, spirits and cigar enthusiast with a penchant for all things vintage, you can find him loitering on Instagram when he isn’t writing for Bespoke Unit. Any other Alec Bradley reviews you are currently thinking of? Now that CP has done the regular Black Market, I have a box of the Alec Bradley Black Market Esteli version. So I think I’ll give that a review in the near future, and maybe a compare and contrast on the blends. Great review. I have these in the humidor at home, may crack one out tonight after reading this. I’ve been doing the same thing myself this evening. I am located in Tennessee. Oh great! We’re based up in Philly, and the author of this post is actually located just outside of Paris, France. Let us know if you have any other comments, or cigar recommendations.